First Bike on Scene (FBoS) course provider B.I.K.E.R.S. Training (www.bikerstraining.com) are celebrating their fifth birthday. The one-day FBoS training course aims to take away the fear of approaching and dealing with an accident, potentially making a huge difference to the injured person. The Irish Motorcyclists’ Association has supported the FBoS initiative from the beginning as a positive and constructive undertaking which contributes to the safety of all road users and motorcycle riders in particular. On behalf of our members we extend our congratulations to Bernadette, Nick, Rodge and Rick on their achievements to date and we wish them every success in their ongoing endeavours. Below is the announcement received from B.I.K.E.R.S. Training concerning the anniversary. October 23rd, 2011 saw Rodge Byrne and Nick Coward run the first ever ‘First Bike on Scene’ (FBoS) course in County Kerry. After lengthy negotiations with the North West Ambulance Service (UK), whose biker paramedics developed the course, their commercial director oversaw the inaugural course. Despite an overall decline in road fatalities in recent years, numbers still remain high, according to the Road Safety Authority. Motorcyclists are one of the most vulnerable groups and unfortunately have seen a number of high profile deaths recently. Any family who lost a loved one will know the void a death leaves, and more so a traumatic one! With this in mind Rodge and Nick brought the FBoS course to Ireland and set up B.I.K.E.R.S Training (Bikers Immediate Kare and Emergency Skills) to train as many bikers possible. Both, are qualified nurses with extensive experience as well as being healthcare tutors. Additionally, Rodge has a background in military nursing and Nick as a paramedic. So you might be wondering ‘what’s this all about’? Well, this one-day course is aimed at motorcyclists, but is open to any road users. It teaches life / limb saving skills in the event of an accident. 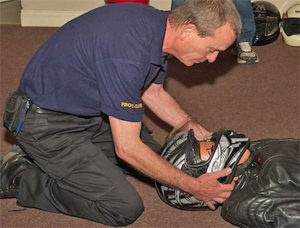 Covering aspects such as safe scene management, head- / neck- and spinal injuries as well as helmet removal and others skills relevant to a biker crash. After intense scenario based training, participants complete a skills assessment. Once completed successfully they receive certification. The Irish Motorcyclist’s Association and the Police Service of Northern Ireland’s BikeSafe Team supported us from the beginning and both remain our most important partners. We also met with the National Ambulance Service’s Medical Director and more recently were invited to join the Bike Buyers Guide for a monthly column. The Road Safety Authority kindly provided safety booklets and high visibility vests, while the Highways Agency in the UK sent road safety DVD’s, which are given to participants. Principal Insurance set up a discount for bikers who successfully completed FBoS training and give free promotional goods. We attend the yearly Cork and Belfast Motorcycle Shows, the Killarney BikeFest and visit club and dealer events across the country. Additionally we added the Irish Heart Foundation’s Adult CPR and AED component to the course as well as the Blood Loss component, adhering to the Pre-Hospital Emergency Care Council and JRCALC protocols. To date we trained 710 people and over the year’s relationships with bikers, clubs, Blood Bikers, Bike Marshalls, members of the Military Services on both sides of the border, the Institute of Advanced Motorists and many more were developed. We would like to thank everyone who has joined us along the way and helped us make ‘First Bike on Scene’ Ireland happen – in particular all the course participants! It has been great to meet and teach you! Whether you have experience in First Aid or not, you’ll find the course enjoyable and achievable. Several FBoS qualified bikers have successfully assisted at motorcycle crash scenes and made a big contribution to the care of the injured biker!